Please allow us to introduce this line of nutritional supplements, in our ongoing efforts to help you keep your family healthy. Designed by a doctor, they are geared toward helping with specific problems that you may be experiencing. 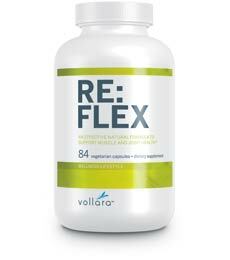 RE-Flex is a proprietary blend of enzymes, powerful herbs, and antioxidants specifically formulated to support muscle and joint health. It is also NSF (National Science Foundation) Certified For Sports. It provides highly concentrated proteolytic enzymes, including bromelain, to augment the body's natural anti-inflammatory systems. These enzymes are combined with powerful herbs like Boswellia, which have been used for centuries in herbal medicine to support the body's healing processes. In addition, RE-Flex provides a combination of antioxidant nutrients to help the body fight off free radicals released after an injury or in inflammatory conditions. Helps the body to repair tissue after an injury. Promotes faster recovery from exercise. Optimizes the body's anti-inflammatory processes. Encourages the body's own production of antioxidant enzyme SOD for faster recovery. For those with an active lifestyle, muscle and joint discomfort can be hard to ignore. All-natural enzymes and antioxidant Nutritional supplements, like the ones contained in Re:flex, support the body's natural anti-inflammatory systems and support the body's natural healing process. Re:flex, Certified for Sport by NSF, provides a blend of unique ingredients, such as grape seed extract and lycopenes, to support the body's own recovery process. The muscle and joint discomfort associated with an active lifestyle can be hard to ignore. For relief, try Re:Flex, a proprietary blend of enzymes, powerful herbs, and antioxidants specifically formulated to support muscle and joint health. Re:Flex provides highly concentrated proteolytic enzymes, including bromelain, to support the body's natural anti-inflammatory systems. These enzymes are combined with powerful herbs, like Boswellia, that have been used for centuries in herbal medicine to support the body's natural healing processes. Click here to purchase "Nutritional Supplements"